My name is Nicole Meyer and it was about 18 months ago that I was in this room graduating from the HOPE for Prisoners workshop like all of you here today. I am standing here today for a couple of reasons. First, to show my appreciation for Jon and everyone at HOPE for Prisoners for the huge impact they have had on my life and in my success. And secondly, In hopes that my story will offer hope to each of you graduating today and provide some insight in to the power of this organization and what it can do for all of you. Ill give you a brief background about my life. I grew up in a really great family but when I was 13 years old, my parents divorced and I ended up here in Las Vegas. My mom was working two jobs and it was just enough for us to barely get by. I hated being here and I hated school. When I was just 14, I made a decision that would change the course of my life. I tried meth for the very first time. In my mind, on that day, I decided that nothing was going to stop me from getting high. I would spend the next 20 years , of my life living out that conviction. Shortly after that day, I left home and spent the next two years on the streets. After eventually getting tired of the lifestyle, I went to rehab and got myself clean. At the age of 16, I discovered something that I loved more than getting high and that was flying planes. I decided to pursue a career as a commercial airline pilot and I did just that. I went on to flight school, college and At 23 years old, I was the youngest female pilot ever hired at Delta Airlines. I had an amazing career and future ahead of me and was determined to keep my life on course. In 2010, I was in a terrible accident and spent nearly 4 months in the hospital which left me unable to fly for over a year due to medical clearance required for pilots. With no career hanging over my head to keep me on track I found myself back into drugs once again. I ended up getting into real estate and opened some sober living homes and ironically started a non-profit, helping inmates on drug charges to be released to sober living. In spite of being able to help hundreds of people get released from incarceration and stay sober. I still couldn’t manage to keep myself clean. I continued to use and began picking up drug charges. One night, I ended up in a car with someone who took us on a high speed chase. I was charged with 5 felony counts and sentenced to 24-48 months in the Nevada Department of Corrections. I remember sitting in that 9 ½ by 11 ft cell, all alone for months with nothing to read except a few chapters from the New Testament. But while I was incarcerated, everything began to change in me and for me. I realized that God had chosen to safe my life and I really looked at my incarceration as a second chance, rather than a punishment. I was grateful for the chance to actually get and stay sober. I spent time at Smiley Road, Camp, and eventually Casa Grande. While I was inside, I had been kept in the dark about things that were going on at home. I never imagined the day that I would have to face the very real consequences of my decisions and face it sober. But that day came and After serving 2 years, I was released. I came home to complete and total devastation. My home was overtaken by squatters and addicts and was in the process of being condemned by the city. Most my friends were either dead or incarcerated and all of my properties, businesses, and money was gone. At one point in my life, I had held a real estate license, a commercial pilots license, a loan officer license and because of my charges, I could no longer do any of these things. I could not even get a job bartending again because I was unable to obtain my sheriffs card. It was devastating, I didn’t know what to do and found myself working for minimum wage in a chocolate factory. I had been there for about 6 months when, I ran into a friend that had just gone through the program and he explained all of the doors that had been opened for him through HOPE for Prisoners. I made my way to the HOPE office and enrolled in their upcoming class. I met some incredible people in that classroom and remember feeling like these people were breathing life into me again. I got the tools and encouragement that I needed to pick myself up and keep moving forward. Not even 2 weeks after I graduated, Jon called me and said I have someone that you need to call. He introduced me to the man who is now my boss and I was hired at Twin Towers Trading. My new boss sat me down and said I don’t care what you have done, the world is your oyster now and I want to see you thrive and be successful, and I’ll do whatever I can to help you. Since being with the company, I have worked my way up to my current position as Director of Training for all West Coast Sales Operations. I am in charge of all hiring and recruiting and I can tell you that the first place that we come when we have positions open is to HOPE for Prisoners. I have had the privilege of hiring dozens of graduates they are by far our best employees. 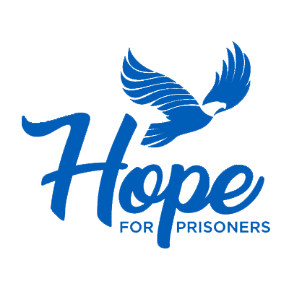 I have recently become a mentor for HOPE for Prisoners, because I really wanted to give back, and help others overcome the challenges associated with getting reintegrated into society. The two most important things I would say will lead to your success now is recognizing the power of association and the power of mentorship. My advice to all of you graduating today is to be very aware of who you surround yourself with. I remember being at a party several months before I got locked up and actually commenting on the fact that I was the only person there that wasn’t a felon. Four short months later I was in prison. However, after being released from Prison I made a commitment to change the type of people I would associate with. 4 Months after I was released from prison, God sent me the biggest blessing in my life, the man of my dreams, and I am now happily married. Together my husband and I made the decision to never go back to that life. He has been my absolute rock and has helped me stay on track and stay positive when things got tough. We have built an amazing new life together, he has given me hope for a future beyond my wildest dreams, and we have changed the destiny for generations to follow. I believe as you find yourself on your new paths God will also send the right people into your lives. Because association is crucial, just like Jon says, show me who your friends are and I will tell you where you are going to be in the future. If the 5 people closest to you are committing crimes and in and out of the system, I can guarantee you are going back to prison. So stay closely connected to the HOPE for Prisoners program. If you work the program you will get everything that has been promised to you and much more. Get a mentor, mentorship is vital to your continued success. There aren’t any other programs around where you can get mentor support from someone who understand your struggle and has a vested interest in helping you. It’s 18 months and you don’t have to pay a dime for it! Get involved, go to the Huddles, and stay close to these people. Be very grateful for everything that you have today, right now, as hard as it may be at times. Remember, you are not your back number, you are not what you did. You have been chosen, handpicked out of your mess, like I was, and given a second chance at life. So I pray for your continued success and want to encourage you all as you leave here today to continue to walk in the direction you are going now. Congratulations!